As it relates to Spinoza and the Caliban Question below, there is an illumination of the special place the comet of the winter of 1664 played in the political, philosophical and poetic minds of that time. 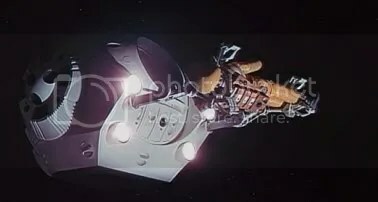 It is thought that Milton had this harbinger light in mind when he wrote of the sword of the “hastning Angel” who ushered out Eve and Adam from the Garden, in the last lines ending the extraordinary poem. Conceivably finished with the comet of ’64 burning still in the sky, Milton’s Paradise Lost, in that it harkens to the soterial and Spinoza’s Ethica stand in particular relation, as mediations on the historically redemptive. I have not seen a study that puts these two together, but should like to. But here is a certain monist clue in the description of sublunary love. The love whose soul is sense “cannot admit of absence”, since the very elements of its composition, if absent, destroy the very love which might do such perceiving. Much as in Spinoza, the idea cannot be torn completely away from its object (knowledge is merely a privation, and there is nothing positive in knowing, which is false). In just a few lines Donne sums up a physicalist argument of a sort, the very recognition of absence is itself the testament of the physical preservation of that love’s elements. In a certain sense, there can be no such missing (or missing is merely a misconception, as Spinoza puts it, it has no Being). The elements which preserve a state prove to its perseverance. Instead Donne proposes an “inter-assured” love of the mind, a presencing in which any separation is necessarily an expansion, and not “a breach”. The transformation of “breach” into expansion is the view of a monist assemblage, and not of a dualism; “mind” is still composed. 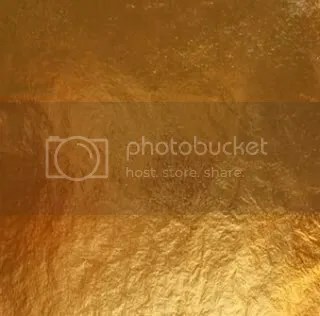 Despite the abstraction of such a love, its spiritualization (compared to gold beat thin) by the same reasoning of compositional elements, is a material endurance, made clear by mind. Though the love after death is not of “eyes, lips and hands”, it seems it must still be physical (just as beat gold is still gold, just as the mind has the body for its object), made of the elements of which it is an expression. In fact, instead of anatomical body parts, it is made now in part by text, in part by bodily afffections, and the relational compositions which preserve. Donne here, in the compassry of two legs, the geometry of a circle, makes an argument against Time (as breach), as the material going out is subsumed in a deeper circle. Like Spinoza he proposes a world where absence has no basis, sub specie aeternitatis, which is experienced through memory, trace, but also the material expansion of those traces in Time, as understanding. 5p23: The human mind cannot be absolutely destroyed with the Body, but something of it remains which is eternal. 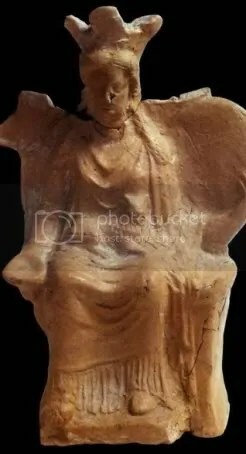 Scholia: There is, as we have said, this idea, which expresses the essence of the Body under a species of eternity, a certain mode of thinking, which pertains to the essence of the Mind, and which is necessarily eternal. And though it is impossible that we should recollect that we existed before the existence of the Body-since there cannot be any traces of this in the body, and eternity can neither be defined by time nor have any relation to time-still, we feel and know by experience that we are eternal. For the Mind feels [sentit, senses] those things that it conceives in understanding no less than those it has in the memory. For the eyes of the Mind, by which it sees and observes things, are the demonstrations themselves. Whereas Spinoza wants to make a distinction between memory trace, and “the eyes of the Mind,” Donne’s point seems a bit more refined, as he speaks of the experience of circular and timeless inscription, as compositional trace, the way that when one “foot” stops moving in time, the physicality that binds foot to foot moves it still, drawing it out, as it stretches so thin as to reveal a tremendous arc, the experience of ending where one has begun. There no absolute dichotomy of existence and Mind, memory and mental seeing. I believe that Donne captures something of Spinoza’s argument, that Spinoza himself is not here capable of. Children of her type conceive of the purest philosophies. Ada had worked out her own little system. Hardly a week had elapsed since Van’s arrival when he was found worthy of being initiated in her web of wisdom. 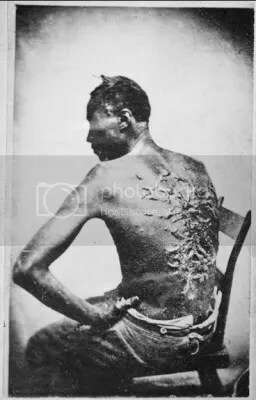 And individual’s life consisted of certain classified things: “real things” which were unfrequent and priceless, simply “things” which formed the routine stuff of life; and “ghost things,” also called “fogs,” such as fever, toothache, dreadful disappointments, and death. 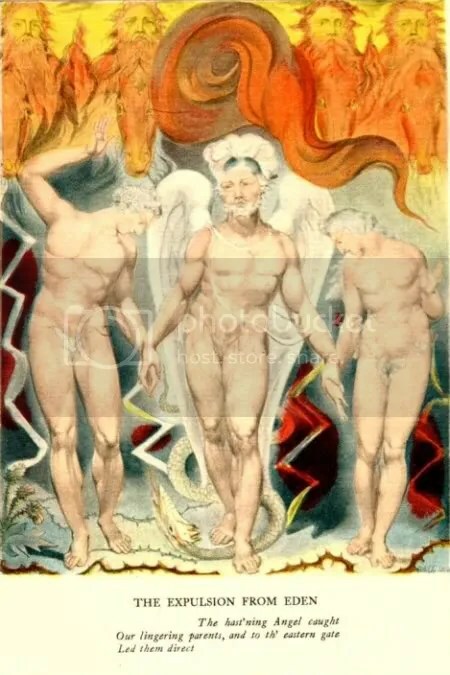 Three or more things occurring at the same time formed a “tower,” or, if they came in immediate succession, they made a “bridge”. Ada’s concept of Towers and Bridges has such strong explanatory value in the synchronic and diachronic, condensations of vertical, stacked, and therefore eternal significations, and transitive happenings, things that lead from one state to another. Beyond Ada’s immediate meaning in the text, the two are striking tropes. A man inherited a field in which was an accumulation of old stone, part of an older hall. Of the old stone some had already been used in the building of the house in which he actually lived, not far from the old house of his fathers. Of the rest he took some and built a tower. But his friends coming perceived at once (without troubling to climb the steps) that these stones had formerly to a more ancient building. 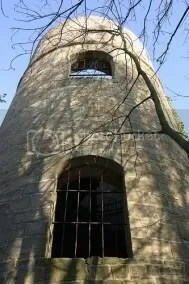 So they pushed the tower over, with no little labor, in order to look for hidden carvings and inscriptions, or to discover whence the man’s distance forefathers had obtained their building material. 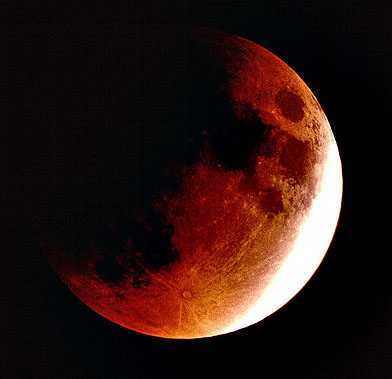 Some suspecting a deposit of coal under the soil began to dig for it, and forgot even the stones. 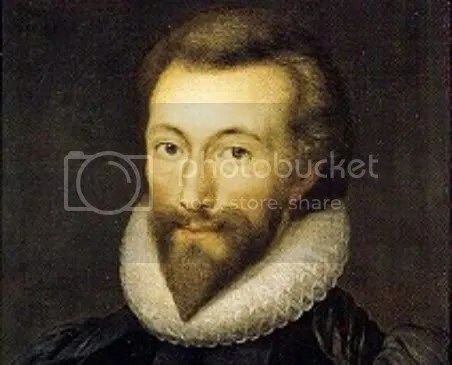 They all said, “This tower is most interesting!” But they also said, (after pushing it over): “What a muddle it is in!” And even the man’s own descendants, who might have been expected to consider what he had been about, were heard to murmur: “He is such an odd fellow! Imagine him using these old stones to just build a nonsense tower! 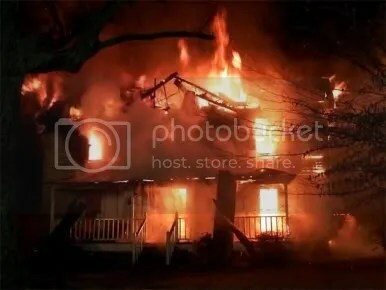 Why did he not restore the old house? He had no sense of proportion.” But from the top of that tower the man had been able to look out upon the sea. The full force of his analogy comes forth when one considers that Beowulf ends with the building of the pyre for the hero, and its service as a signifying tower over the sea. What is compelling here, is the realization that synchronic towers, whether they be made of the unique, “real” things in life, as they are for Nabokov’s Ada, or be they artistic re-stackings of ruins, seeing the Horizon through the material of the Past, are condensed verticals which serve as Bridges. Narrative scales. There is more to say here. But it is a beginning. põs anaginóskeis;: How Do you Read? 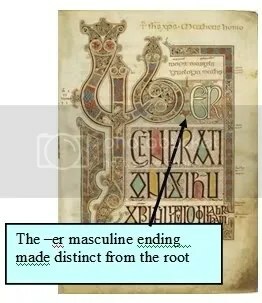 The direction that this analysis takes is towards the Lindisfarne Gospels, and towards ultimate question of their mystery. I will leave aside the direct question as to the reasons why, after centuries of non-aestheticized sacred texts, here, in the hollows of insular monasticism, at a veritable edge of Western Civilization, there in particular arose such a fantastical relationship to the letter, to the graphic reality of the inscribed thing. What I will take up are the individual modes of expression, as they are found in one exemplar page of this Gospel, so as to unveil the very mechanism of conceptual expression, in hopes that something of the “why” might be seen in the “how” and the “what”. That is, from the Incipit page of the Gospel of Matthew, in examining its typographical character relationships to rune language, its various lexical conflations found within the fonts of such characters, and then its compositional expressions of the whole, as a subject matter, I will seek to show that the artists behind this creation sought to not only record, but enact an eternal truth; and in enacting it to provide a suitable object for meditation, saying something not only about man, language, and history, but also, necessarily, about God. Best it is to first introduce the Matthew page from the Lindisfarne document (above), it containing the first verse from that Gospel. 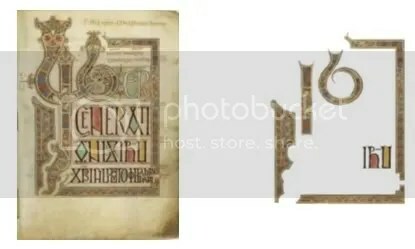 It reads, in translation: “The book of the genealogy of Jesus Christ, son of David, the son of Abraham;” and in Latin Vulgate: “liber generationis Iesu Christi filii David filii Abraham“. The thesis which drives this paper will be that the conceptual content of events that is described in text, will be performed by text, and its typographical, lexical and compositional expression. If my thesis is correct, the book, the material evidential record of Jesus’ line of descent into this world, will be exemplified by the very words and how they are displayed. That is the incarnation of Christ as God, come from its human braid of ancestry, will be made to appear. The reasons for this will be hypothesized about later. As one can see, even given the text content itself without any adornment the exact words on page prove a bit of a visual puzzle. One has to mentally strain to pick up each due letter; one has to recognized that some Latin forms have been replaced by Greek lettering – without using the Greek word; one must see that for instance “Liber” is part of a fanciful curvilinear vortex of forms, or that “S” that ends “generationis” has become a nearly a boxed “x”. What is it that the monkly hand is doing?, we are forced to ask. That which in most texts should be made most clear, is being made, here, obscure. The sacred text, which is in most cases one would expect to be transparent, here, needs to be itself engaged. I would like to add to this puzzle the first layer of analysis, that which answers the question, leaving aside for just a moment, the contorted “Liber” at the top, just why are the letters of the main part of the page made in such a boxed fashion, with strong crossing diagonals, bent-back end-pieces, so that each letter diverges from its expected Latin form, but converges on a kind of typeface. If perhaps we unlock the aesthetic and conceptual reasons for their form considering that they are the least divergent perhaps we will have clue to the other expressive deformations. 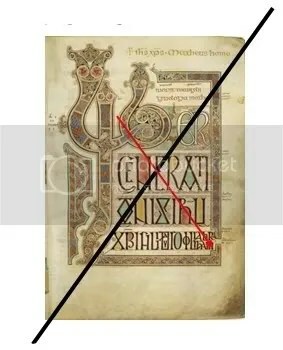 If one considers the historical circumstances of the painting of this document one understands that Christianity has come to position itself in relation to a druidic and pagan past. There is in a certain sense both a completion of, and a break from a pre-Christian polytheism and animism of clans wherein nature itself was populated by natural forces and spirits. 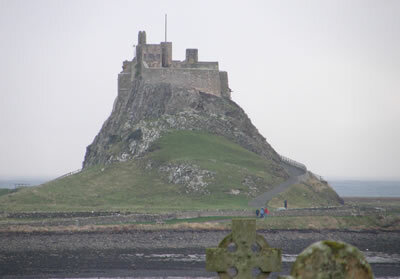 This forms the Anglo-Saxon and Celtic genealogy, if you will, of Northumbrian Christian beliefs, a past which has grown into a Christian present. If we saw a page made for the mediation on Christ’s genealogical antecedents, one would not be surprised to see Anglo-Saxon figurations present to express the historical developments of the people. That is, just as Jesus came from the Jews, we, a Christian we, have come from pagan times. Present are the same essential rectilinear forms, the cross-patterned verticals, and even the repetition of particle letters (much as Greek letters were used, but without transliterative meaning). Exemplary of this pattern making, found here in the very aesthetic center of the block composing the “s” in the Latin word “generationis” is the runic letter dagaz (meaning “day”), accomplished by the double-backed ends of the Roman “s” and the symmetrical and close placements of the “I’s”. 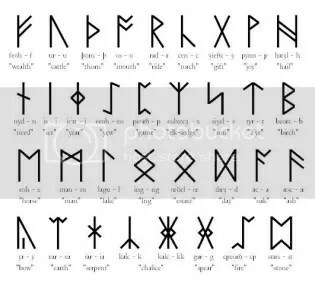 That the meaning of the rune itself has bearing on the meaning of the word generationis could only have added to the meditative form of the text. Such connections are more than tenuous. 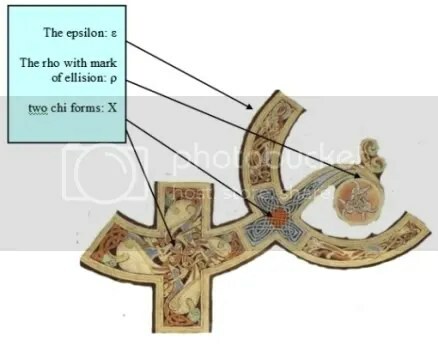 As one can see from the alphabet table above there an additional co-incidence between the Christological letter Chi found in the bottom of the block text and the Anglo-Saxon letter gebõ, meaning “gift”. Greek Christ as Anglo-Saxon gift. This takes us to an underlying thought which steers this analysis: the form of the presented word was not meant solely as a transparency, but as a rich condensation which would serve as vehicle for the deeper understanding and experience of the message of the text. We shall return to the Franks Casket for further evidence, but it suffices to say how that as a working hypothesis the runic quality of the internal block text typeface may be expressing something of the genealogy of Christian Britannia, just as the text is telling the reader about the Jewish genealogy of Christ, each of them expressed in some typographical variation (a runic font past, and a Latin to Greek mixing of letter). What remains to be seen is if this typographic exemplification is bolstered by a lexical conflation. What I mean by lexical conflation is that a single typographic form can be read as being multiple words. This can occur either in one language – for instance how the form “bear” can mean both the animal and the to carry a burden in English – but more importantly, (depending on how the individual letters are visually deciphered, for instance if a “y” can also be read as a “p”), a single word can form different words, in different languages. It is my contention that part of the role played by the fantastic forms of lettering employed by the craftsman, was to enable the word-forms to represent multiple words, and thus multiple meanings, and so in this way, depict and enact the very incarnating processes of the eternal God becoming man this portion of the Gospel seeks to record. That is to say, much as how this particular word-form exists in a finite way, what it represents and calls to mind in a plethora of words, meanings and genealogical matter is the historic reduction of the Infinite to the finite itself. This is part of the meditational structure of the Lindisfarne Incipit pages. The best way to proceed would be simply to present the occasions of a hypothesized lexical conflation, in a series. Because these are contemplation devices, the substantive effect of multiple readings of a single form will lie with the reader. That is, beneath a primary word in the text, one person might find the presence of a secondary or a third word likely, and another not. It is the very rubic nature of these forms that can defy assertabilty of their fact. The first of these concerns a mere lexical multiplication of meanings, as can be found in the initial word “Liber”. This word, by size, color, form and placement, set off from the rest of the text, allows itself to float independently from the context. A reader of course would know very well that it meant, “the book” but given its compositional status, the word itself would be able to take on object status, conveying its own truth. 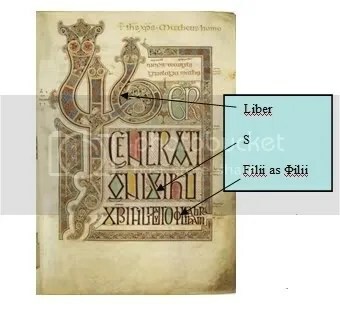 What becomes noticeable when we take “Liber” out of its context is that not only does it mean “book” in Latin, if we allow the last vowel to lengthen, it also means “A man free of”. And given this meaning, the phrase “Liber generationis” would mean “A man free from generations”. What is remarkable about this secondary reading is that it gives the secret understanding of what the incarnation itself was. 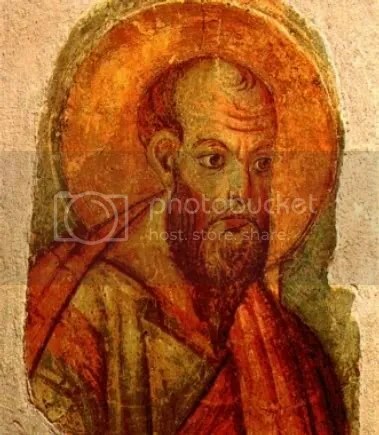 As the text tells us and enacts for us (the incarnation of a God into the finitude of generations) the result of this is a man, in fact any Christian man, who is free from (de)generations. The infinite becomes finite, so that the finite (man) can no longer be finite. The secondary thing one notices in the form of “Liber” is that the -er is set out from the Lib. One sees that in our second reading, the grammatical root/ending distinction becomes enforced. The base of the word is freed up from the -er to express itself, as it does aesthetically, coiling in a rich core of graphic signification. If we set up the one lexo-graphic unit and attempt to uncode what it would represent we must free up our mind to the kinds of associations possible for it to evoke. Though we are already predisposed to seeing the L-i-b of liber book in the form, really it is not apparently there in any obvious manner. The “I” is quite distended, and crosses over the bass of the “L”, and the “L” runs into the over-round “B”. 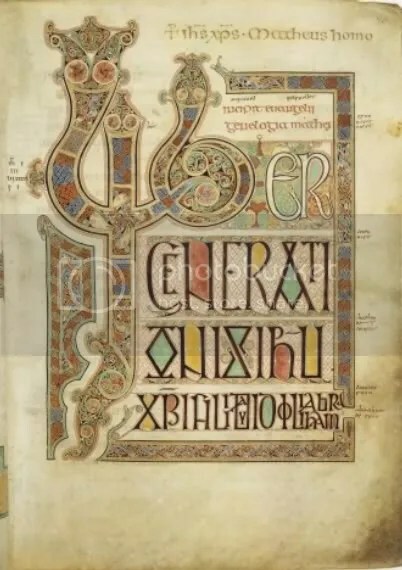 In ruminating over the “root” of Jesus’ genealogy several Anglo-Saxon words impose themselves here, over this one aesthetic form, none of them strictly being less present than “lib”. The first of these is an invocation, given that “lib” is severed from the -er. The Anglo-Saxon word for “Life” is “libban” and it is hard to imagine that such a meaning would not be present in these isolated graphic elements. Further, given the way that letters are forced to be found in letters, in this form not only is “Lib” found but “Lyb” in that the L and the I combine to form the “y” . Lyb in Anglo-Saxon means “poison”. In presenting the origins of Christ’s past we have the graphic conflation of Anglo-Saxon words for “poison” and for “life” placed upon the Latin word for “book”, but “book” translated back from the Latin also can mean “birch tree” (in an interesting confluence of meanings, the Anglo-Saxon word for “book” boc can also mean “birch tree”). All of these invite us to return to the origin of the genealogy of Christ, that of the tree of Eden, the tree of genealogies, and even the tree upon which he was crucified. This is even further insured in the Biblical equivalence of this line from Matthew with the same incipient line from Genesis 5:1: “hic est liber generationis Adam in die qua creavit Deus hominem ad similitudinem Dei fecit illum” [this is the book of the generations of Adam, when God created man, and made him in the likeness of God, (RSV)]. Christ is the new Adam, he who will in generations from sin make man a liber, a free man. This internalized Christ insignia is repeated down below in the “XPI” abbreviation in the last line of the block text, acting out the very unfolding of history, the notion that Christ was there in the beginning, buried at the heart of the tree of knowledge, which following the fall unfolded itself in the lineage of Jews, beginning with Abraham and the first formal covenant. And there is further lexical-typographic conflation lower in the text, wherein the divine is found within a name, as in the line “Christi filii David”. “David” is twisted – the lower form of the “D” is expanded to represent an “O”, and the “A” and “V” tossed into an obscurity- so to form the word “Dio” Latin for God, making the line read the double meaning, “…of Christ, son of David” and “of Christ, son of God”. This again cements a reading of multiplicities of typographic condensation, enacting the very message of the text, performing the incarnation itself, but in such a way that all of its elements become nested for a means and process of meditative reading. As we pull back from the text, and examine the totality of the presentation, one more graphic element strikes us and remains to be explained if we are to enter into an analysis of the composition as a whole. The top of the reported L is crowned with what seems to be a decorous serpent head, whose eyes and nostrils flare in a symmetrical focus upon the reader. Considering the entirety of meanings found in this portion of the text it seems clear that this is the serpent in the Tree. In fact the entire Lib/Lyb form of the upper left half composes a source diagonal of time and meaning, stemming from the serpent event in the Garden. 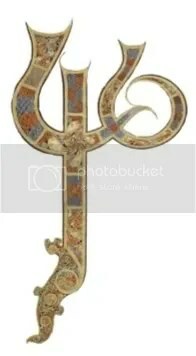 Time begins with this serpent figure woven out of letters, in the Tree, and works itself down through rune-like fonts in the generations of Abraham and David, until the arrival of the liber, the free man of Christ. It can be seen that the composition itself forms the very matrix of a history, a history of Man, and a history of Britannia. We can see that the shrinking of figures denotes their approach to death, falling under the press of battle. Something of the same is being communicated as the letters of words are being forced to cram themselves into the smaller and smaller space of finitude, giving us the strong sense of Christ having to squeeze himself into this world, into a specific time and place. But there is conceptual complexity, a folding back on itself, given in this depiction of incarnational time, for as the text of the page ends down to the lower right corner symbolizing the progression of time towards Christ’s incarnation, it is narratively going backwards in time, from Christ Jesus, to David, to Abraham. The overall involution presents the paradox of a historicized eternal vision. As history unfolds, it seems to return to its initial kernel state. It goes backwards and forwards at the same time. This same union of antagonisms can possibly be seen in the very construction of the frame within which the text is contained. In terms of signification the Serpent-body Lib/Lyd extends in decorated form to compose the entire border of world history. Here the time of the genealogy of man is depicted as enclosing world history. The world belongs to the garden serpent, and to Satan who he represents. But as the words work themselves down from the upper left, into smaller and smaller manifestations, in the figured name of Abraham they finally break through this frame. The covenant of God made with the Jews becomes fulfilled in the person of Christ, breaking the stranglehold of the serpent expressed in the descent of sin. In just this way this initial page of the gospel of Matthew, in its variety of condensations and conflations of meaning as it tells of the very descent of a man, performs an ascendancy. And even one might argue that it puts again a trace of his name “Ihu” in the very compositional form of the frame which will hold him. 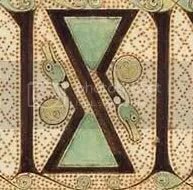 The very serpent/tree lettering, come from a magical Celtic past, is seen to flower in the person of Jesus, coming out of that pagan richness. The individual pieces of evidence provided here can each be dismissed as reaching for meanings that are not truly there, but the whole of them I think are too significant to remain determinately unseen. 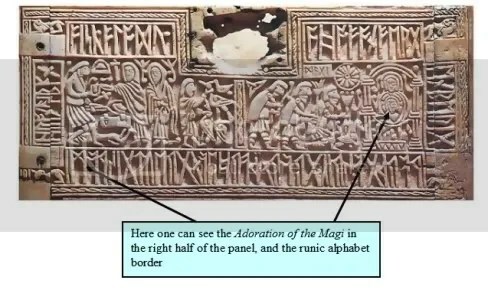 The greatest strength of such a reading is that it moves to an answer of the question, Why did the monks of insular manuscripts suddenly start treating text as if it were a material, signifying and performing thing? While much of this answer may lie within the exact nature of how religious artifacts were magically conceived in the Celtic past when considering the remarkable stages and forms of condensation accomplished by the artist of this one page, there is the singular sense that a page of this gospel was not merely to be read but was meant to be contemplated, as a thing in itself. There, before whomever watched it, a play of meanings and significations drawn across languages, heritages, and theological concepts manifested itself. A reader saw something of what was implied in the phrase “the genealogy of Christ”. All that a genealogy of a God requires is pulled in and somehow exemplified. And the reader as well, the particular history of his place in time are also engaged. The reading of the text becomes an epiphanic realization the longer you look at and consider it, how the infinite itself, could have become finite, how a “book” became a “free man”. The Latin Vulgate Bible. http://www.fourmilab.ch/etexts/www/Vulgate/ . Accessed May 7, 2008. Schapiro, Meyer. The Language of Forms: Lectures on Insular Manuscript Art. Piermont Morgan Library. July 19, 2006.